This is the set of Dr. Ph. Martin's Bombay India Inks that I bought recently. Unfortunately, one of the bottles leaked during shipping and messed up the packaging. Thankfully there's still quite a bit of ink left in the bottle. I don't think it's the problem with shipping (I bought mine from Amazon), but it's just the way the bottles are designed. More on that later. The bottles can either be laid flat or upright in the white plastic holder, which also doubles up as a mixing palette. The only India inks I know of so far are all black-coloured inks. I did not know that there were coloured versions of India ink until now. India inks are pigmented inks. They are waterproof when dry, and lightfast. Dr. Ph. Martin's claim that these inks would "adhere to nearly all surfaces" and it seems like the case here when the ink leaked in the packaging. The leaked ink dried and adhered quite strongly to the plastic -- you probably need to scrap that off with a screw driver. Another claim is the inks are non-clogging when used in pens. That I'm not too sure about because these are pigmented inks after all. Dr. Ph. 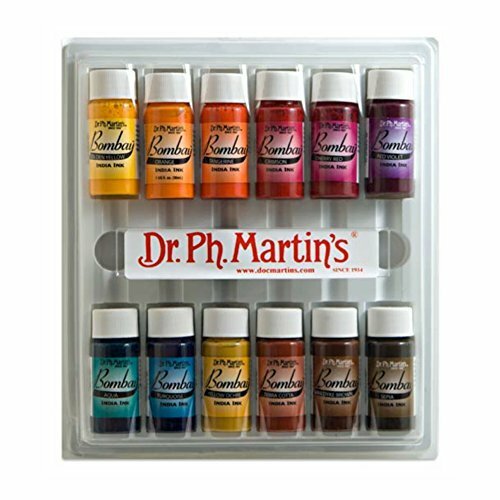 Martin's sell a total of 24 colours. You can get each colour individually, or get them in 12-bottle sets. These are the colours in the two sets. These Bombay India inks are meant to be transparent. I was actually expecting them to be opaque. The only two colours that are opaque are black and white. There are also two variations of bottle. The smaller 15ml bottles are made of plastic. The 30ml bottles are made of glass and come with droppers. When I opened the bottles, many of them had the seal stuck to the opening. I had to carefully peal them off. This is very annoying. To prevent this, you can use some glue to stick the seal to the back of the cap. Make sure the glue has dried before putting the cap back on. The problem with the cap is one main reason why I would recommend the 30ml glass bottle to the 15ml bottle. The other reason is the eye-dropper included is very convenient. The dropper allows you to extract ink out of the bottle easily for mixing. If you get the plastic bottle, you have to spend extra to buy droppers and you have to clean the droppers after each use so that not to contaminate other colours. For some colours, namely Terra Cotta, Yellow Ochre, Sepia and Van Dyke Brown, there's a tendency for the binder to separate from the pigment. This happens when those bottles are in stationary position after a while. So before using them, the bottles have to be shaken to mix up the contents. This issue only happens to the earth tone colours in this set. I'm not sure about set #1. These are the colour swatched I painted out with a brush. The primary colours are really vibrant and intense. The inks are able to retain a sharp edge so this makes them good for drawing or calligraphy work. When the earth tone bottles are shaken too hard, they will produce bubbles and if you don't want for the bubbles to disappear, they are going to appear in the wash. The bubbles also affect how the ink will flow in a dip pen. Overall, the earth tone inks looks thicker than the other colours. Ink flow is fine but the primary colour inks flow more smoothly with the dip pen. Here's a sketch I drew with a dip pen. Note that the edges to the lines are sharp. There is no feathering as well, and the ink does not bleed to the page behind. This is the Terra Cotta colour that has the binder separation issue. Because the ink is not mixed well, the wash can appear diluted. For this sketch, I used the inks with watercolour. The inks are waterproof when dry and works great with watercolour. The thicker inks (Sepia above) have a tendency to be more viscous. If you use a brush, it can be difficult to move the wash around as there is that sticky consistency. Also when the ink is thick, it's a bit difficult to flow on the dip pen nib. The inks perform quite well with the exception to the earth tone colours where there are binder-pigment separation issues. Overall, these inks are wonderful to draw with because of their ability to hold a sharp edge. They are waterproof when dry so these are suitable for mixed media art as well. Those who practice calligraphy should find these inks easier to use than acrylic inks that dry too fast (even inside bottles). I really enjoyed drawing with these inks. My only regret is I did not get the glass bottles with the dropper. My general recommendation would be to get either the glass bottle sets, or get the glass bottles individually if you do not need the earth tone colours. Check out more reviews on Amazon. Direct links below. Check out Jackson's Art (UK) too. What are the difference between these and watercolours? Can they be used interchangeably? 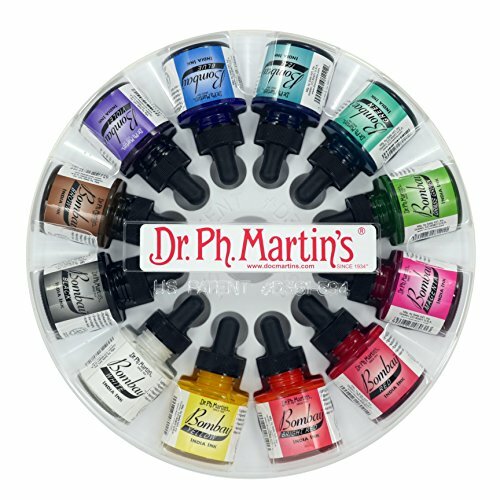 I also noticed dr ph Martin has a watercolour range called hydrus. I’m not sure what the difference is but they appear in similar packaging. This inks are meant more for drawing and not painting. They are more suitable for creating lines. You can paint with them by adding water, but they aren't as easy to use as watercolour or the Hydrus products, which are easier to use with paintbrushes. Really helpful review. I was wondering if it is possible to mix these colors e.g. mixing the yellow and a red to get orange? Thanks!